This image shows the elliptical galaxy NGC 5128, also known as Centaurus, where a strange source nearby dramatically flares X-rays unlike any ever seen. This entire image is about 58,000 light-years across; the zoomed image is about 3,500 light-years across. Red, green and blue colors in the galaxy's center represent X-rays as well. Astronomers are scratching their heads over two mysterious objects in space that are unlike anything scientists have seen before. The objects blast superbright, superfast X-ray flares and could represent a brand new type of astrophysical phenomenon, the researchers said. When these weird X-ray sources flare up, they become 100 times brighter in less than a minute. About an hour after a flare, the brightness returns back to normal. "We've never seen anything like this," Jimmy Irwin of the University of Alabama, who led the study, said in a statement. "Astronomers have seen many different objects that flare up, but these may be examples of an entirely new phenomenon." Other objects in the universe can also create bright X-rays. These objects are called ultraluminous X-ray sources (ULXs), and they typically stem from black holes or neutron stars — the small, dense corpse of a star gone supernova. But the newly discovered sources are hundreds to thousands of times brighter than typical ULXs, the researchers found. "These flares are extraordinary," Peter Maksym, a study co-author from the Harvard-Smithsonian Center for Astrophysics, said in the same statement. "For a brief period, one of the sources became one of the brightest ULX to ever be seen in an elliptical galaxy." "When not flaring, the sources appear to be normal neutron-star or black-hole X-ray binaries," in which another star orbits a dead neutron star or a black hole, the authors wrote, "but they are located in old stellar populations," unlike other known objects that have repetitive flares as bright as the mystery objects. The best comparison is likely a magnetar, a young neutron star with a powerful magnetic field, the researchers said. Magnetars also produce bright X-ray flares. While magnetars are thought to be young stars, the two flaring objects in this study reside near elliptical galaxies, which contain older stars. So the objects are likely too old to be magnetars, the researchers said. 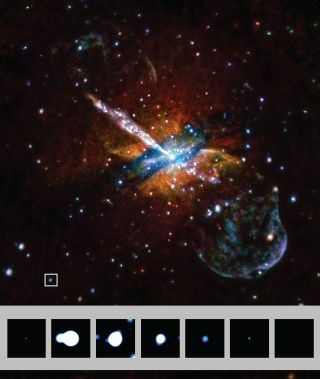 Animation of flaring X-ray source in Galaxy NGC 5128. After a flare, magnetars take only a few seconds to return to a baseline level of X-ray radiation. The new flaring objects take about an hour to settle down. In between flares, the mystery objects remain much brighter than magnetars do. Another ultrabright and inexplicably fast X-ray flare observed in 2005 inspired the researchers to search for additional mysterious X-ray sources. The scientists looked through archival X-ray observation data of 70 different galaxies from NASA's Chandra X-ray Observatory and the European Space Agency's XMM-Newton Observatory dating back to 1999 and found two more strange X-ray sources. One of the unidentifiable objects in this study lies just outside Centaurus A (NGC 5128), an elliptical galaxy located about 13 million light-years from Earth. The other is in a globular cluster of stars located just outside NGC 4636, another elliptical galaxy located 47 million light-years from Earth in the constellation Virgo. The source in Centaurus A flares about once every 1.8 days, the study found. Due to limited observation data, the researchers could determine only that the object in NGC 4636 flares at a minimum of every four days. "Now that we've discovered these flaring objects, observational astronomers and theorists alike are going to be working hard to figure out what's happening," said co-author Gregory Sivakoff of the University of Alberta in Canada.